Spanish for Law Enforcement: Basic Spanish Guide Series 2 Edition As a component of The Basic Spanish Series, BASIC SPANISH FOR LAW ENFORCEMENT, is a career manual designed to serve those in law enforcement professions who seek basic conversational skills in Spanish. Written for use in two-semester or three-quarter courses, it presents typical everyday situations that pre-professionals and professionals may encounter when dealing with Spanish speakers in the United States at work settings such as police stations, prisons, and on the street. 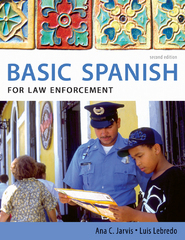 BASIC SPANISH FOR LAW ENFORCEMENT, introduces practical vocabulary, everyday on-the-job situations, and culture notes (Notas culturales) written from a cross-cultural perspective. It provides students with opportunities to apply, in a wide variety of practical contexts, the grammatical structures presented in the corresponding lessons of the Basic Spanish core text.